Islanders website: Has the recap of tonight's 5-4 win at Toronto with Ted Nolan's comments praising his club's sense of urgency and his powerplay with Freddy Meyer's thought's. Excellent win, loved the hard work in the corners and how hard all the lines competed in this one. Outside of the first goal DiPietro was very solid and was his best when they needed him to be. I don't know what game Howie Rose and Billy Jaffe were watching but I thought that was a heck of an effort top to bottom tonight and the Isles deserves a lot more credit than they were giving them. They easily could have had another three or four goals with the chances they were earning. Islanders were the better team on the puck, won the battles in the corner and earned the power plays they got and made the most of it. Power play was outstanding with cross-ice passes to players cutting to the net like Bernard for a goal, or a beautiful pass to Comrie for another, with Vasicek getting a high quality chance which Fedotenko buried. Satan made some great passes to set up some goals. Just a good team effort in this one. cross-checked without a second penalty coming to Toronto. Of course nothing's easy and a goal find it's way in off a deflection to make it 1-1 and a second goal off one point shot makes it 2-1, but the Isles did not panic and got it right back and regained the lead which they extended into the third. Goes without saying the calls were going to start to even out and in the third they did. Park and Hilbert made some great reads to kill the five on three and Sutton did all he could to be Brendan Witt when he had to be with a big block. 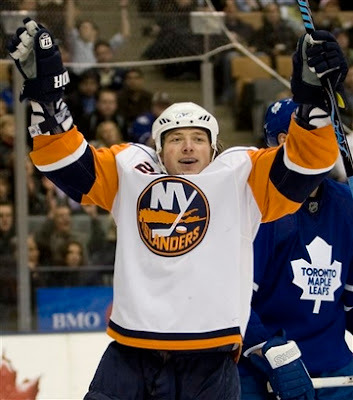 Freddy Meyer's first Islander goal with an open net made it 5-3 which was the game despite the Leafs making it 5-4. I liked what I saw tonight from the Islanders, the chances and how they worked to get into high quality area's was very impressive. They needed a regulation win in Toronto for the first time since before 2002 and got it. AP claims they won in regulation March 28th 2002 at Toronto but I was sure that was a 5-4 overtime win.....whatever. Fedotenko's playing like he was earlier this year, very visible with the chances he was getting, now his shots are going in as he's getting to the high quality area's. For Fedotenko and the Isles, it has to continue.